Avoid diabetes and live forever! 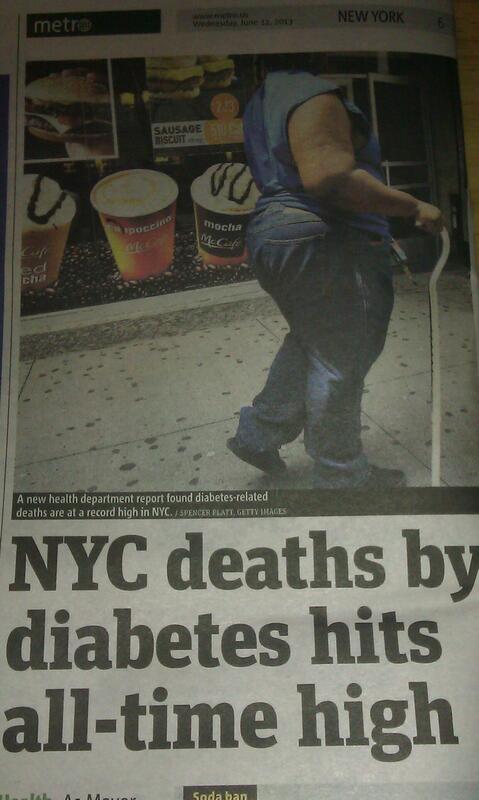 She’s fat and using a cane… obviously she has diabetes! Welcome to my “official” fatty blog although I’ve sounded off on fat related issues in “Rising from the Ashes”. Hopefully there will be more raves than rants in future posts but this, boys and girls, is most definitely a rant. Yesterday Metro New York ran a story about how diabetes-related deaths have hit an “all-time high” and that the “diabetes-related mortality rate” is greater in “high-poverty neighborhoods” like Brownsville in Brooklyn. Let’s go over the “facts”, shall we? Of course the story ran with yet another headless fatty picture… a woman using a cane while walking past a McDonald’s ad. Not getting into the implication that because she’s fat she must be a frequent Mickey D’s customer. What I want to know is who’s the psychic on the Metro staff who knew that not only does the lady have diabetes but is using a cane because of her weight? Apparently it didn’t occur to anyone that she could be perfectly healthy (no diabetes, high cholesterol, hypertension or cardiovascular disease) and needs the cane due to an accident or that she may have even been participating in a sports activity and injured her ankle or knee. Here’s another quote about diabetes that gets my proverbial goat… “It is linked to our epidemic of obesity, and, like obesity, it can be prevented.” First of all, if obesity can be prevented why is the diet industry making tens of billions of dollars annually on programs and pills that have a long term failure rate of 95%? Also, what of the other causes of diabetes? The following is from the American Diabetes Association website. Also, let’s not even consider that residents in high-poverty areas don’t have access to and/or can’t afford quality health care, medicine and fresh, nutritious foods thus the increased rate of diabetes. Of course not… the obvious solution is to get rid of the fatties. Then we’ll be rid of diabetes and live forever!